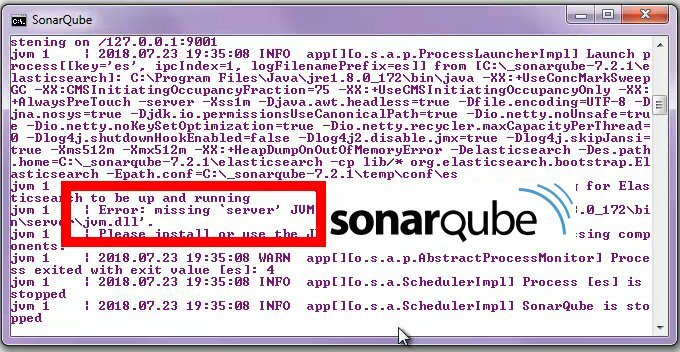 If you’ve downloaded and installed SonarQube but you keep running into a message such as ‘jvm.dll is missing’ or ‘jvm.dll not found‘, and it’s triggering a ‘missing server JVM’ error, the likely problem is that the program is defaulting to a JRE installation rather than a JDK. To solve the ‘missing server JVM’ error, first check that there is indeed a JDK installed on the local operating system. If not, you need to install one. If there is one installed, you need to make sure SonarCube is defaulting to the utilities in the JDK’s bin directory and not that of the JRE. One way to do this at the SonarQube level is to edit the wrapper.conf file. You’ll find it in the SonarQube installation’s \conf directory. # Path to JVM executable. By default it must be available in PATH. With the JDK configured properly, subsequent calls to the StartSonar shell script or batch command should run to completion, without any complaints about how the ‘jvm.dll is missing’ or how the ‘jvm.dll not found’ or that there is a ‘missing server JVM.’ SonarQube should start up normally, and the only thing you’ll have to worry about is passing the various quality checks the static code analysis tool puts your programs through.